One More Day -- Yay!! 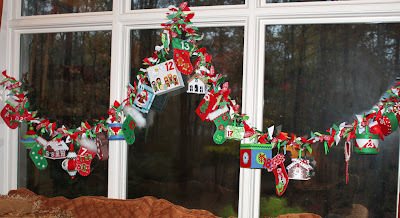 That is, one more day until we start my favorite holiday tradition -- The Advent Calendar. One of my sweetest memories from childhood was the advent calendars that we would buy every year when visiting my aunt in Florida for Thanksgiving. There was an amazing Christmas shop there open year round in a wonderful, old house. It was a treat for the eyes, especially for us kids! These kinds of stores are everywhere these days, but back in the 70's it was an anomally and a real special treat. Surrounded by Christmas trees in all shapes and sizes and colors and of course, all of the thousands of ornaments and holiday candies, I was in complete awe. But my favorite things were always the advent calendars. 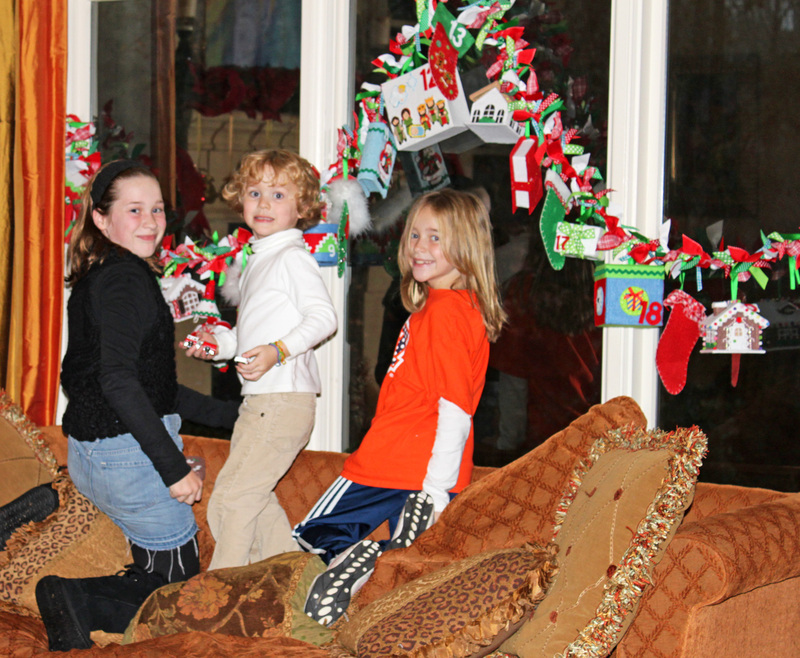 And the funny thing was, they were nothing more than cardboard with a printed Christmas scene. No prizes, no candy, just little perforated cardboard doors that you would punch out each day of December counting down to the BIG one. It amazes me to this day how much enjoyment I got out of waiting day to day to see what little picture was behind that door! 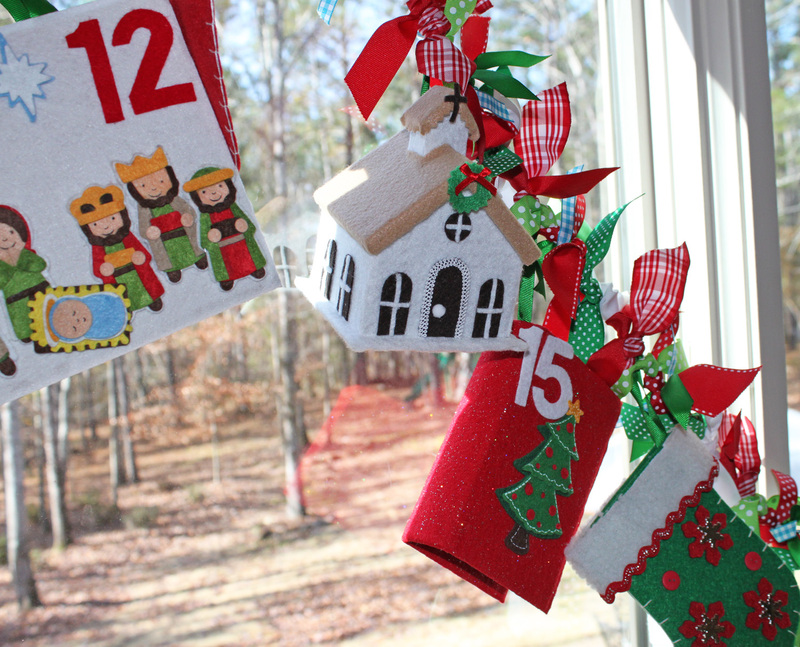 I have always made advent calendars a part of my own children's Christmas traditions, but it usually took form in "the easy way out"..... the Dollar Tree cardboard advents with a small piece of chocolate each day for a prize. And then last year I decided to create something really special for them, something that I hoped would last for many years to come. I wanted an advent that was large enough to hold some small prizes, and I also wanted to handmake something so that they knew it really came from Mommy's heart..... just for them. I took various paper machie' holiday forms from Hobby Lobby like drums, gingerbread houses, ornaments, boxes, books, etc and covered them with felt and other decorations. I also used some pre-made felt stockings that I added feather boas, ribbons, ric-rac, and other fun things to. Here are some close ups. 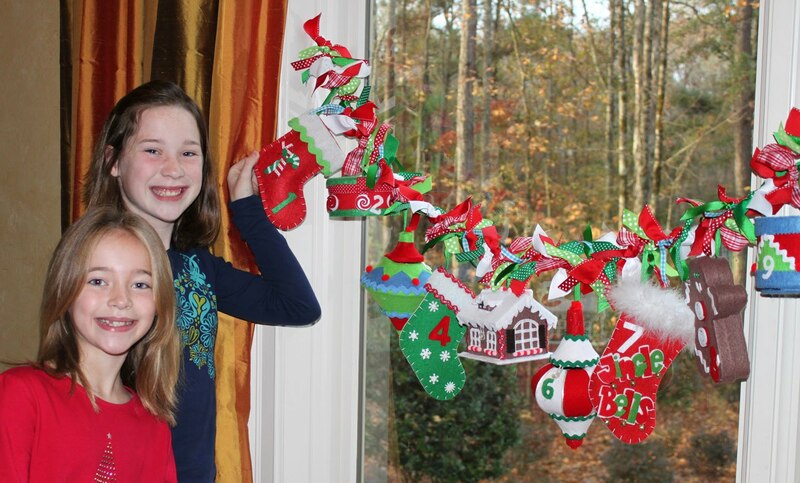 I bought most of the felt decorations like snowflakes, the nativity, the Christmas tree, etc. I traced the numbers onto felt and cut those out myself. I also made all of the windows, doors and crosses for the church. 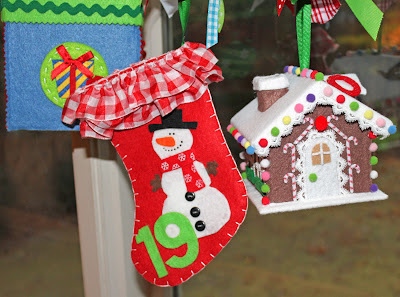 I bought the snowman felt piece but added the number 19 that I cut out of felt and the ruffled ribbons at the top of the stocking myself. 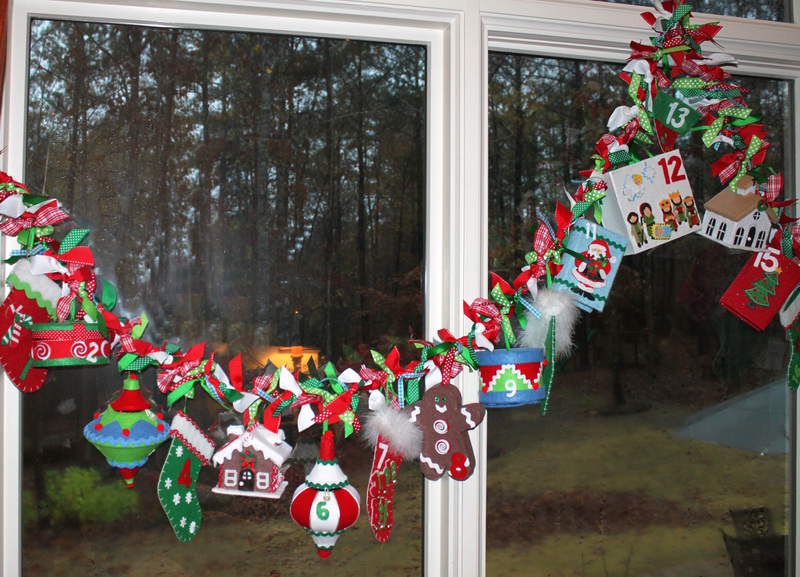 For the gingerbread house, I used a lacey trim, some felt and small felt balls that I hot glued on to the house. I found some very small candy cane ornaments at Hobby Lobby which were actually small Christmas tree ornaments. I cut off the little hanger at the top and glued them around the door of the house. I strung all of the pieces onto a ribbon and added tied pieces of ribbon in between each advent piece. Every night before the next advent day, I fill the day's advent piece with small prizes, pieces of candy or a note with a fun activity for the day. I can't tell you how excited my children get over this! It was worth every moment of time that I put into it. Which leads me to the next little tidbit of information for you..... It took about a month last year to make -- it's not for the faint of heart! But it is a cherished holiday tradition and I hope a piece that will be used even when my own kids have their children. Just look at how happy they are! And it makes the morning routine a little easier, too. I make them do all of their "getting ready" activities first before they can run over to the advent..... amazing how quickly they can get things done when there's a little motivation! I hope you will all create your own advents this year, whether elaborate or simple, it's a wonderful way to celebrate the season each and every day. what a gorgeous piece!! wow! Every year I hope and sort of plan to make an advent calendar. Still didn't get to it this year. I guess I've still got a day. Your's is great. So festive. 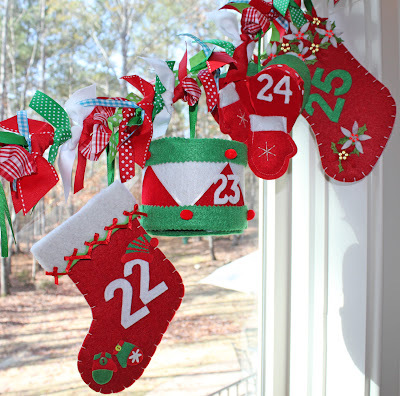 The most amazing advent calendar I have ever seen, what a treasure for your kids!! LOVE it! Sharing on my facebook page, Pirates-n-Princesses!! Wow - this looks great! It's beautiful. What a great idea! It looks gorgeous. Going to try it next year for sure! SO cute! I'm hosting an advent link party and would love for you to join! You always make the CUTEST things! I love this advent calendar! I'm going to have to check my Hobby Lobby for some of these cute lil' forms. :) Thanks for linking up at Sassy Sites today! This is really cute! I love advent calendars and yours is really special. I can’t wait to get organized for a peaceful and frugal holiday season! St. Patricks Day Free Printable - Lucky You! Halloween done.... Fall treat YUM!